Diamondback 910Ef Elliptical utilizes a bright blue LCD display for a high contrast view of all your workout information. The included speaker cable offers the ability to play your own music through the built-in speaker system.It is built-in Media Center holds your iPad, iPhone or iPod and connects to an Apple® charging pin. It also holds other mp3 devices, with most being charged via the USB port. 35 workout programs- Including heart rate controlled training, custom user programs, fitness test and many others. 32 levels of resistance- Insures smooth resistance transition between program intensity levels. Adjustable handlebars- Allows user to custom fit the 910Ef to their body size and type for a comfortable, perfect workout experience. Target heart rate programs- With Polar® compatible wireless receiver and hand grips sensors, the 910Ef keeps the workout intensity just right. Sealed cartridge bearings- Gives the 910Ef an ultra smooth feel and keeps it whisper quiet. Product Weight : 204 lbs. ToughTrain 3.0 out of 5 Have average features. Can be a best deal if offered some more discount. Ellipticaltrainer.com 6.22 out of 10 A decent buy, but the features feel overdone and will most likely go unused. *Note: Most of the sites, stores or shopping portals listed above sell Diamondback 910Ef Elliptical with discounts and other exciting offers. There is a possibility that the some of above websites are not selling Diamondback 910Ef Elliptical now. Toughtrain.com is not liable for such cases or instances. 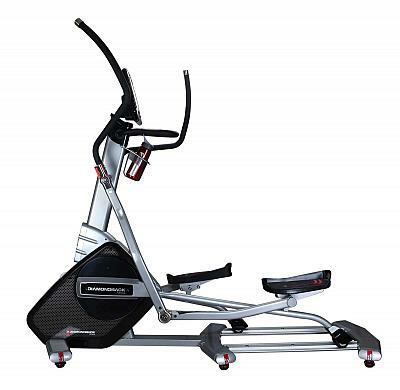 Also we do not recommend any seller for Diamondback 910Ef Elliptical and a buyer should buy from where he/she gets best deal with quality of products, service and on time delivery (shipment).